Viceroys (Limenitis archippus) are true brush-foot butterflies. They are found from April through October throughout peninsula Florida in brushy fields and near freshwater. They fly quickly in a series of erratic movements and glides. Viceroys feed on manure, carrion, and the nectar of composites. Adult butterflies have 2.5-3" wingspans. They look very much like Queens and other milkweed butterflies, but are smaller and have a black band across the hindwing that the milkweed butterflies lack. Willows serve as hostplants. The eggs, pale green or yellow, are laid individually on the tips of leaves. The caterpillars look like bird droppings. They are brown and white and have bumps with branched spines. The caterpillars feed on catkins and leaves. They attach bits of leaves with silk and hang the cluster near where they are feeding. The chrysalis is brown with silver or cream coloring. A disk extends from the back and wraps around it. Viceroys are apparently mimics in all phases of their life cycle. As adults, they look like bad-tasting Monarchs. The eggs are difficult to spot on willow leaves. Not only do the larvae look like bird droppings, they may hide in the clusters of leaf bits they create. The clusters may also serve to distract predators from the larvae feeding nearby. The chrysalis also looks like a bird dropping. 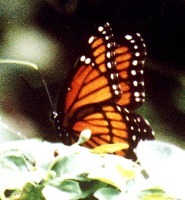 More photos of Viceroys are in the Photo Gallery, including a comparison of Viceroys and Monarchs.